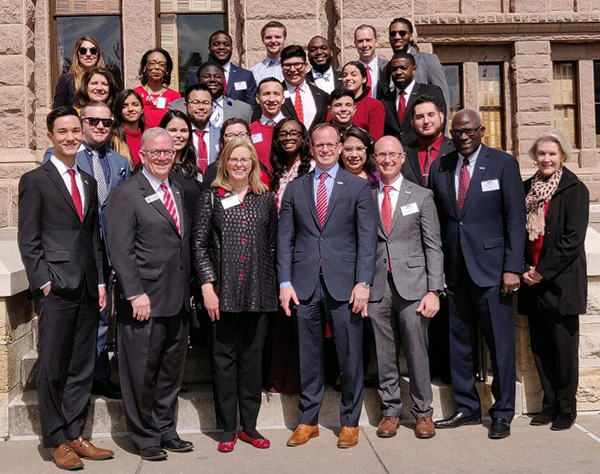 University of Houston-Victoria students, administrators and President’s Regional Advisory Board members traveled Feb. 25 to the Capitol in Austin to meet with legislators and make a case for the university’s budget request for the upcoming biennium. Included in the budget request was $74.7 million in bond authority to further establish UHV’s residential campus; the restoration of nonformula funded items, including funding for downward expansion, institutional enhancement and the Small Business Development Center; and more. UHV representatives were honored by proclamations and recognition from Texas Sen. Lois Kolkhorst and Rep. Geanie Morrison.